In a country with a dearth of conifers, the Tasmanian highlands boast several species, most notably the two in the Athrotaxis genus: pencil pine and King Billy pine. These relicts of Gondwana have closer relatives in New Zealand and South America than they do in mainland Australia. Of the two only pencil pine will grow in virtually pure stands, especially in parts of the Walls of Jerusalem National Park. To walk into a pencil pine stand is to change climate; change light levels; even to feel you have changed hemispheres. There is a cool, dimly-lit quiet, aided by the thick foliage and the soft carpet of needles. Time itself seems to take on a different quality, as though picking up on the pencil pines’ slow-growing, long-lived nature. As gymnosperms, they mainly regenerate via the shedding of cones, although even this is an unusually unhurried affair, occurring only every five or six years. In peat they also appear to spread vegetatively via suckering. Neither method allows them to spread far from the parent tree. Given their slow growth – they average 40 years to reach just one metre, and can live to well over 1 000 years – they don’t appear to do anything hastily. I find it hard to resist ascribing entish characteristics to these lovely conifers. Their tactic in the conditions they seem to find themselves in – a drying part of a dry continent – is to wait out bad times and take advantage of good times. That climatic good times may be in long-term decline is just one problem for them. Another issue since European take-over is the spread of herbivores such as rabbits, sheep and cattle. All of these find pencil pine seedlings more palatable than do our native species. In historic times this has created further pressure. But one bad time factor far outweighs all others. Fire is the deadly enemy of the pencil pine. Having evolved in wet or even water-logged conditions, where fire is a rarity, pencil pines have few defences against bushfire. Recovery is via slow spread from surviving trees. In a drying, fire-prone future this is a high risk strategy. This January a walk with the Ada map took me to Great Pine Tier, an upland only modestly higher than the surrounding plateau. But the tier distinguished itself, and was so named, because of the prodigious stands of pencil pine that historically stood there. That was until 1960. Between October of that year and February of the next, a series of catastrophic, deliberately-lit fires in the area burned through an estimated 1300 square kilometres of alpine vegetation. Geographically that took in much of Ada and many of the neighbouring map sheets. A significant proportion of the area incinerated contained pencil pine, deciduous beech (or fagus) and ancient peat. Without knowing the full story of this fire, my friends and I were meandering between the myriad lakes around Great Pine Tier. But when we reached the epicentre of the fire we could hardly have mistaken that we were late witnesses to an ecological catastrophe. Half a century after the event the area still looks like a war zone. With gallows humour we remarked on how easy the walking was thanks to the fire. In truth we were aghast. For miles around us we could see pencil pine stags, literally by the thousand. Their vertical persistence in death is owed to their tightly-packed, borer-resistant, resinous wood. Bleached white by the icy winds, they stand like a vast wartime graveyard, a ghostly reminder of the glory that once was. 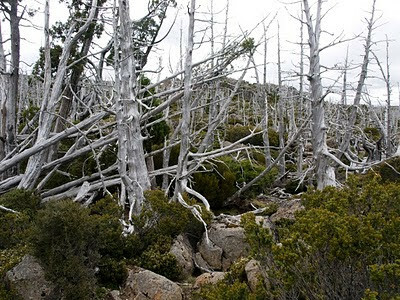 In patches, particularly on the western rim of the tier, small stands of pine forest persist. Walking into one of these felt like walking through a door to another country. Everything was different, the contrast heightening the helpless and hopeless sense of what has been lost. Beyond such patches, the slowly burgeoning new growth is dominated by other species. There is a changing of the guard, with fire tolerant eucalypts and other flowering plants now taking over. It’s fair to say that pencil pines have been made locally extinct as a result of that single fire event. You would therefore think that such an event would be burned into the Tasmanian psyche, much as the Hobart area’s 1967 bushfires are. Yet most of us have no clue that this tragedy occurred. So I recall with a chill my recent discovery of a fresh fire ring butted up against a living pencil pine near the West Wall. Some cold or heedless walker has ignored that they were in an area where only fuel stoves are allowed. If these last stands, and especially that around Dixons Kingdom, succumb to such stupidity, there may be generations of Australians who never have the chance to see the glory of these gracious old Gonwanan forests. I have loved and walked among the pencil pines for much of my life. I had no idea that so many had been destroyed in the 60s. How awful that they might be so threatened. A beautiful photo, and a lovely piece about these wonderful trees. I thought the photo said it all! But your description was delightful and moving - it took me there. I love the reference to Ents!! Mere Words: Can Nature Writing Make a Difference?